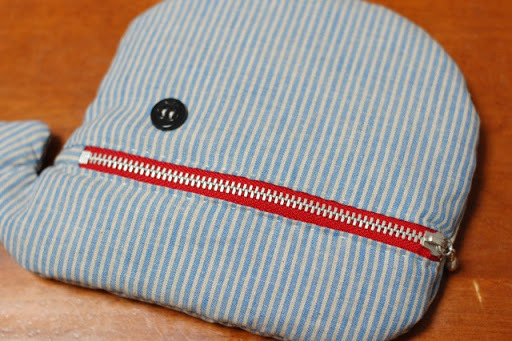 I sewed a whale shaped pouch. But my boyfriend said it was an elephant. It's a whale, because it has a big mouth! Either way it's cute! It looks like a whale when it's unzipped. The red zipper is the perfect touch! I'm thinking another idea of zipper pouch. Could you please give me your mail id. I'll add you. Otherwise you won't be able to access to my page. my mail address is maimairuru(at)gmail(dot)com. 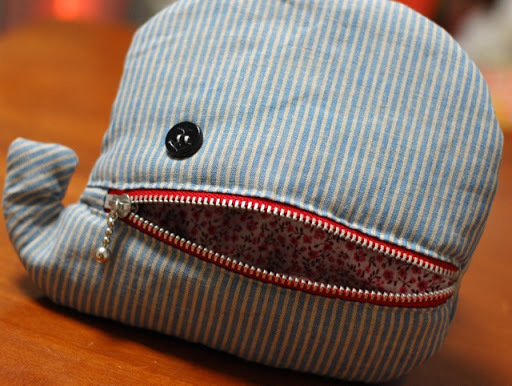 very cute....but I think a whale with a big happy mouth! I love this pouch and the blue striped fabric is gorgeous. I also love the cat eat fish pouch, such a great idea! I am one year late in my comment but that's because I am reading your blog from the first post. I've been following you for a while, but I haven't read all the way back until now. It's lovely, I'm having fun and getting a lot of inspiration! Thank you for your wonderful posts! Oh I love the whale!! He's gorgeous! I can see the elephant too, when it's unzipped, I guess that just makes it a magic bag! I would love instructions on this! love this! i'm going to make a kangaroo shaped one!